One of my absolute favorite things about summer is dining al fresco on the patio! There’s just something about eating outdoors on a lovely day that is just so delightful. But what makes it all the more charming and more than a little romantic is to dine at a table, beautifully set. 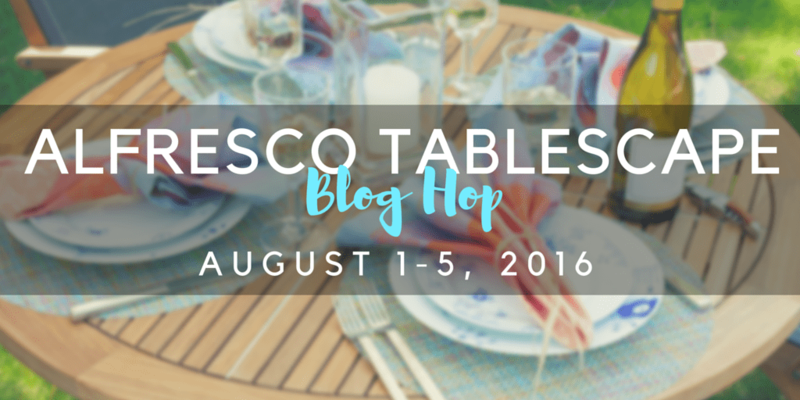 I’m joining with a wonderful group of talented bloggers to bring you a summer tablescape blog hop dedicated to dining al fresco. You can find the links to the other table settings at the bottom of this post. If you’ve been reading my blog for any length of time, you well know my love for mismatched vintage china. I love to collect odds and ends and bits and pieces and mix them all up in varied ways. 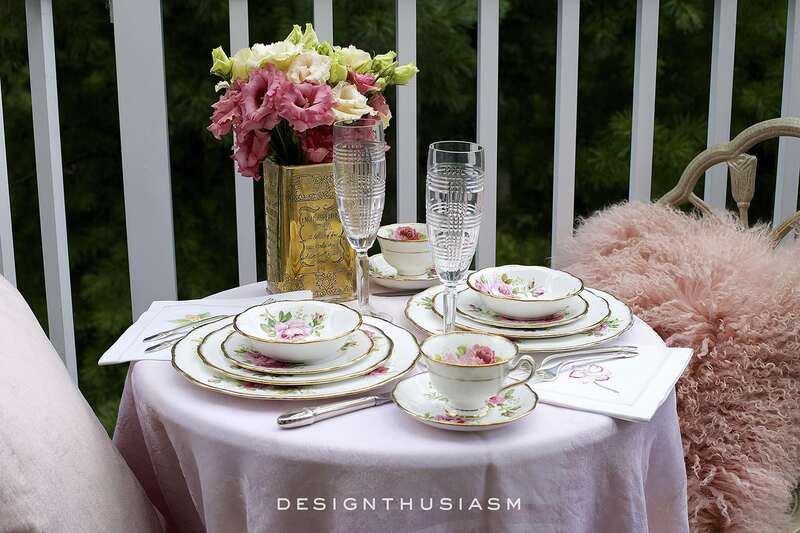 But what you may not know is that I actually do have, and sometimes use together, a full set of Royal Albert American Beauty and setting a table with the many different sized pieces really magnifies the beauty of the floral. Playing off the lovely floral china motif, my centerpiece is comprised of sun-drenched, curly-lipped lisianthus. I used champagne flutes from Ralph Lauren in the glen plaid crystal pattern. I’ve had these glasses for a very long time and I use them over and over, as they work with just about any table style you can imagine. I also have the wine goblets and the highball glasses and they have a weightiness to them that makes them feel quite distinguished. I have so many different pieces in this exquisite pattern that I even have two different types of teacups; one with the roses peeking out from inside the cup and the other with the blooms on the outside of the cup. I love how easy it is to find pieces to add to my collection and I’ve spent countless hours on ebay in this pursuit. My floral is tucked into a vintage silver tea tin, bought an an antique market in London, but you can find them online, as well. When not brimming with flowers, I keep Earl Grey (my favorite tea) in this tin. For napkins I used these stunning embroidered linens from Fragonard, Paris. They come in a set of four and each one is slightly different. We have a decent sized patio but most of it is dedicated to a conversation area with lounge style seating, so we added this sweet little bistro set for just this purpose. The rose toned pillows are from West Elm. The pale pink damask tablecloth is vintage, found at a local market. It’s fun to see this pattern used in its entirety because I so often mix it with very different pieces. You can see how different it looked in this Christmas tablescape mixed with plaid and again in this breakfast setting mixed with red transferware. I’ve actually forgotten how long it’s been since I used it together in all its floral glory! Lory, your china is beautiful. I love how your centerpiece vase picked up the gold in the China’s rim. Your flowers are gorgeous. Thank you so much, Pam! Sometimes it’s fun to just pull out the classics… 🙂 Thanks for visiting! Delightful Lory, and those flowers!! I’ve never seen those before, I am crazy about the curly edges, they look stunning with your beautiful china. An enchanting and cozy table for 2, I would love to curl up with that poofy pillow! Thanks, Jenna! 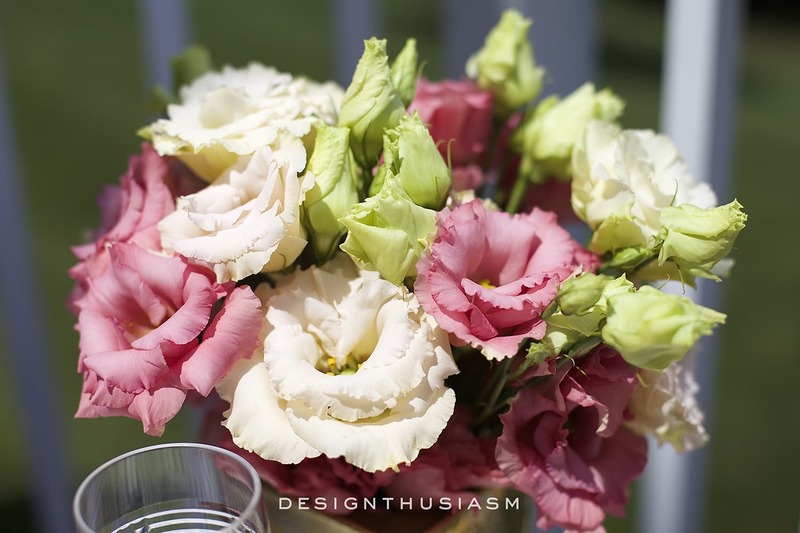 I”ve actually just become acquainted with lisianthus blooms, as well… 🙂 They come in varied colors and are quite lovely. Thanks for stopping by!! Lory, I love your elegant style! Gorgeous lisianthus in the vintage tea tin. I always like something vintage and fresh flowers in a tablescape. Your napkins are the piéce de résistance! Lory, it’s all so femininely beautiful, but it’s the flatware that caught my attention! What’s that pattern? It looks so nice with the RL Glen Plaid. Very masculine and feminine – a yin yang I love! I’m glad you mentioned the masculine / feminine mix because I would call that a sort of signature style of mine. Thanks for visiting!! I love your complete set Royal Albert American Beauty. It is so elegant and classic as one, but I also love how you used some of the pieces in your Christmas setting. It was just as lovely and sophisticated with the tartan plates. Your setting was lovely being displayed outdoors and your fresh flower centerpiece is such a beautiful touch. The tablescape would make the perfect setting for a cozy and intimate dinner. Thanks, Marsha! I actually agree that I kind of prefer it mixed with other patterns because I’m all about the pattern mix, But every so often it fun to use it all together because that’s become so different for me… 😉 Thanks for stopping by!! Oh Lory, such a beautiful table! I am so glad you joined us with your lovely tablescape. 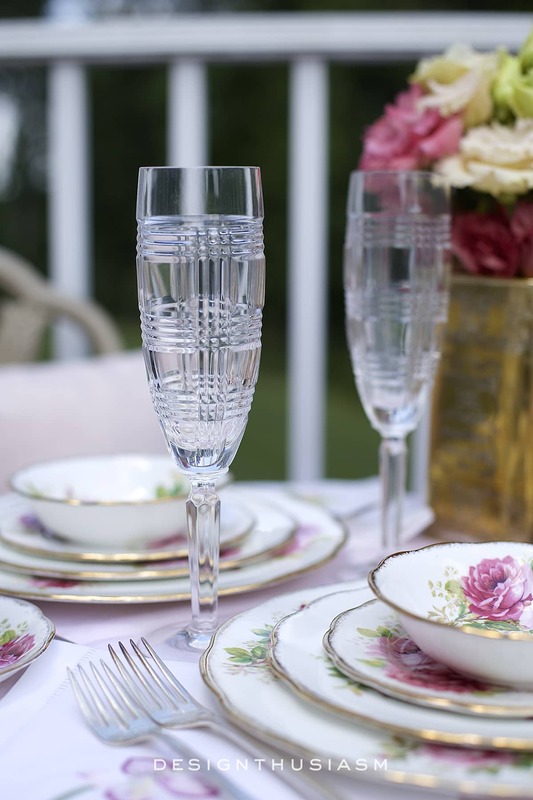 There is nothing like dining out of doors but using real china and crystal, it makes it seem so special, doesn’t it? The pretty pastel pinks are so cooling, perfect for a warm summer evening. Just beautiful, Lory! I just love the use of the tea tin as a vase. Romantic indeed! Your collection is fabulous and your pride of it shines through. So lovely. Your tablescape is perfection! I have a thing for teacups with a “peekaboo” design inside (you find a surprise design inside after you drink your tea). Those napkins look so special. It’s nice that you used elegant china and crystal for your al fresco meal. I like to do that, too. NO paper plates for me! So beautiful Lory. The table looks fabulous with your pretty china. Loving the soft color, so feminine and pretty. Pure elegance for outdoor dining is always a pleasure. You have captured the essence of Alfresco with an elegant touch. Thank you , Linda! Even though outdoor dining is inherently casual, I always think it’s fun to dress it up a bit with china… 🙂 Thanks for visiting!! I love this soft, feminine romantic table setting- so beautiful! 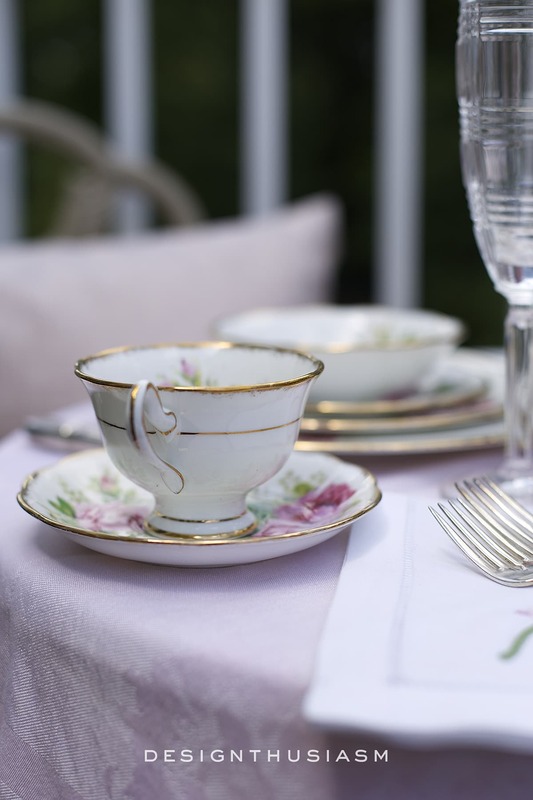 I have collected antique teacups since I was a girl and this inspires me to get them out! I love how feminine and intimate this table setting is. The china is beautiful and I love those Ralph Lauren glasses. But, my favourite is those gorgeous flowers in the vintage tin! Isn’t it true that no matter how pretty the tabletop elements are, nothing can beat fresh flowers? 🙂 Thanks for stopping by!! I love the charming table setting, that beautiful gold can looks like a olive oil can, I could nt make out what it said, I am swooning over it! You got me thinking! The tea set reminds me of my vintage one my mom gave me. Lovely job! Thank you so much for the kind words! The tea tin says “English Breakfast Tea” and it’s actually silver, even though it clearly looks gold in the photos and several people have commented on that. It was a very sunny day and I think the reflection of all the pink made it look gold… lol. Oh my goodness! What do I not love about this tablescape?! Nothing! It is breathtaking! So feminine and dainty. 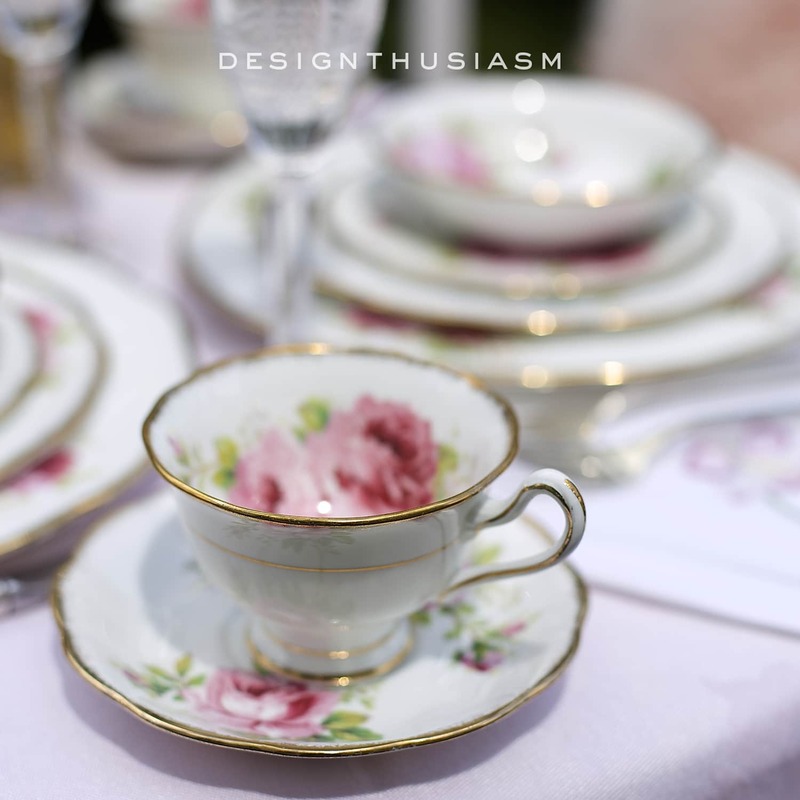 I love the Royal Albert, Old English Rose, as well. Beautiful table! Thank you so much for your very sweet comment!! Your table is absolutely gorgeous! 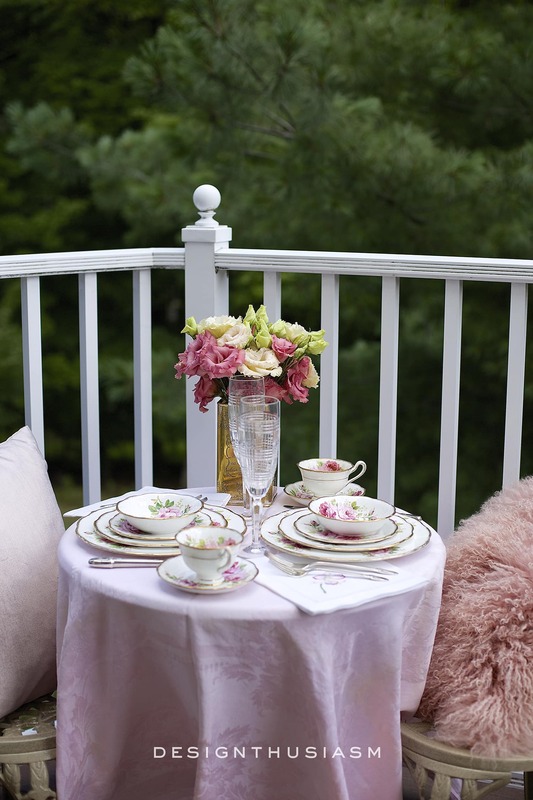 I just love the pinks…tablecloth, in the flowers and china. Very feminine and romantic. Thank you so much, Rhonda!! Stunning! 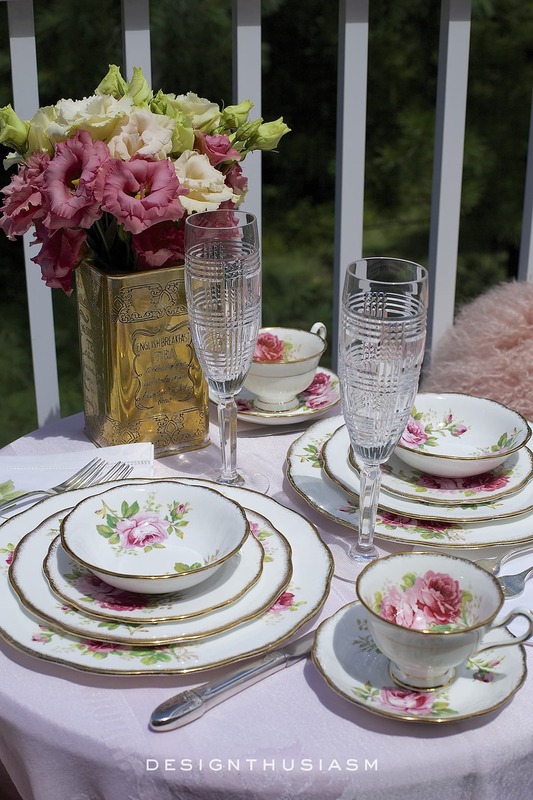 Love the pink and pretty china. Your tablescapes always seem to have one beautiful element in common…gorgeous floral arrangements in the best possible colour-coordinating displays that tie in perfectly to your dishes and accessories. How I would love to dine at this table! The blog hop is turning out to be so fun with such lovely tablescapes such as this! Thanks, Lori! And I’m enjoying it too with so many great tables. Re the florals, I actually generally set my table first, then take a quick phone pic and take that with me to the flower market, so I’m picking flowers to genuinely match the table. Ironically, in this case, i actually has them left over from a photo shoot from a few days before… lol. From the first image to the last, I was swept away by the beauty and magic of your tablescape. The roses and soft pink, with hints of green and gold, are stunning and elegant. I just love your style! Wow is all I can say to your comment. Well, and thank you so much! I absolutely love everything about your table setting! Mixing china patterns can be nice, but nothing beats the extravagance of a fully matched set of china. The gorgeous flowers added just the right finishing touch! Thanks, Judith! Isn’t it finny when the traditional full set feels like something new because we’ve been mixing for so long? Your tablescape is gorgeous! 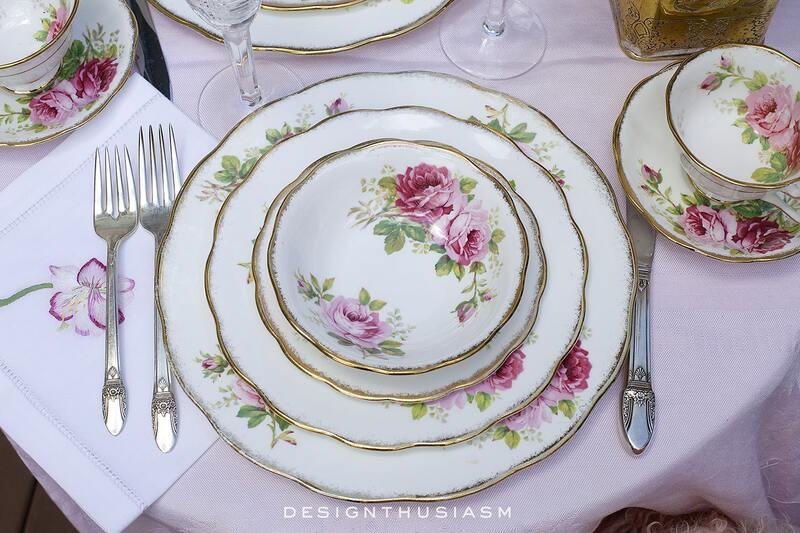 Your china is absolutely beautiful and goes so lovely with the pretty table linens. 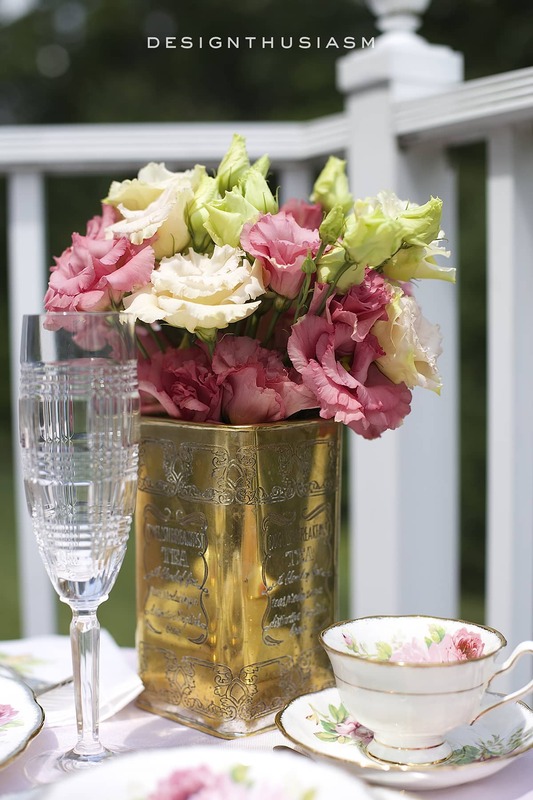 Your flower arrangement with the vintage tea tin is the perfect touch! Thank you so much for such a lovely comment, Shannon!!! I enjoy it both ways too… mixed and not. So glad you enjoyed it as well… 🙂 Thanks for visiting!! Amazing how versatile that rose pattern is. I’m going to start looking at my floral porcelain pieces with a new eye…and you could almost make me like pink with that Mongolian lamb pillow! 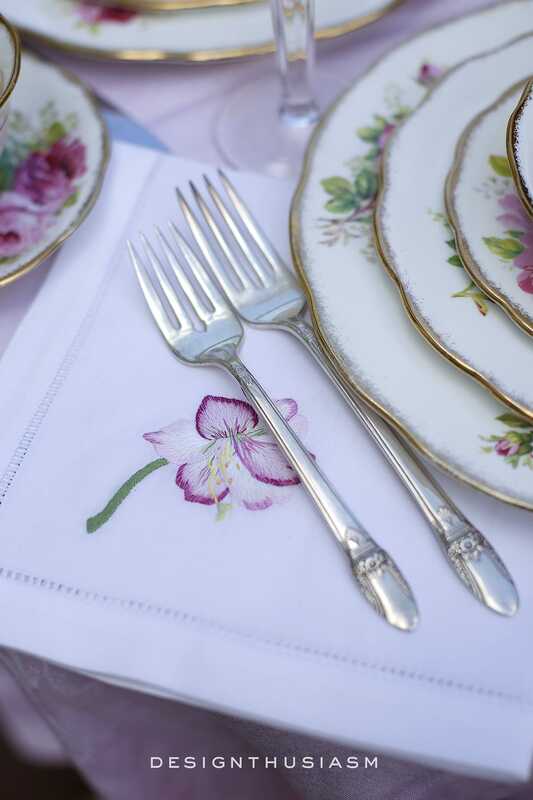 Love your Royal Albert china…stunning table setting! It’s so nice that you set such a gorgeous table for just you and the hubby. I’m sure he must appreciate all the love. Thanks! I think he just shakes his head and never knows what to expect on the table… lol! Lory: Your posts with the Royal Albert roses are among my favorites. I just love this China, and you display it so beautifully in your tablescapes. What a pleasure this visit has been! That gold tin vase is EVERYTHING!! Oh my gosh I love the lisianthus too! Such a lovely floral tablescape!